Nokia announced today that in partnership with the Helsinki University Hospital they livestreamed a neurosurgical operation in mixed Reality using Nokia OZO and OZO Live platform. “The procedure was livestreamed to approximately 100 neurosurgeons using Nokia’s OZO Live to provide a more immersive view of the surgery and operating room coordination,” says Nokia. The livestream is part of a joint project called “Media meets Medicine” in collaboration with the Neurosurgery Department of HUH (Helsinki University Hospital). You can read the full press release down below. Helsinki, Finland – Nokia announced today the world’s first ‘mixed reality’ neurosurgical live streaming conducted at Helsinki University Hospital, Finland. The procedure was livestreamed to approximately 100 neurosurgeons using Nokia’s OZO Live to provide a more immersive view of the surgery and operating room coordination. The live streaming trial is part of a joint project called “Media meets Medicine”, and was completed in collaboration with Helsinki University Hospital (HUH) Neurosurgery Department, a world-leading department for its expertise in all subsections of neurosurgery. Nokia sees virtual reality completely transforming how people can experience the world together; the live streaming at HUH showcases how virtual reality can advance the healthcare industry by delivering an immersive experience, regardless of the location of the viewers. 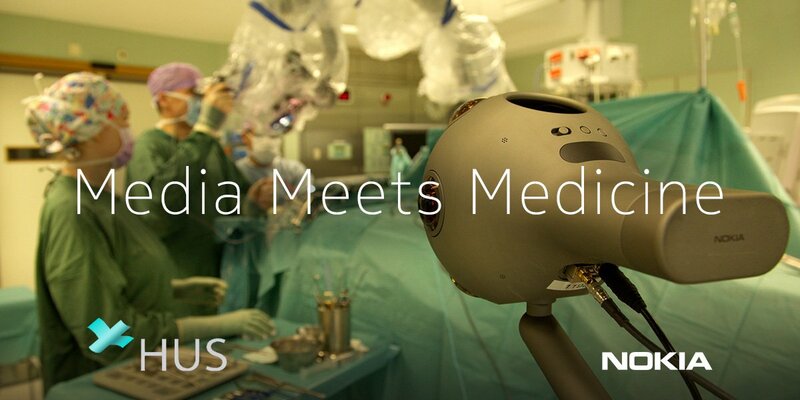 Nokia OZO was used to deliver a completely new, live broadcast mixed reality experience of a neurosurgery operation using the OZO Reality Platform and viewed on OZO Player SDK. The experience consists of the stereoscopic 360 degree OZO camera live stream with spatial audio, complemented by interactive microscope and graphics overlays. The Nokia OZO system delivered a live view from the operating theatre to the participants of a live demonstration course in operative microneurosurgery at the Helsinki University Hospital on 6-7 June as part of the the 17th Helsinki Live Demonstration Course in Operative Microneurosurgery. “Normally, only up to 10-15 external observers can fit in an operating theatre in addition to the operating team. When using Nokia OZO Live streaming we could have limitless observers from around the world and they can all feel as if they were there,” says Professor Mika Niemelä, Chief of Department at HUH Neurosurgery. “HUH wants to be a forerunner in exploring, identifying and demonstrating novel opportunities in the virtual, augmented and mixed reality domains, and drive concept creation for future virtual and augmented reality in medical context. We are really happy that we can cooperate with the Nokia team, who are pioneers in this area,” says Miikka Korja, Neurosurgeon at HUH Neurosurgery and Chief Innovation Officer at Helsinki University Hospital. “This is an excellent example of using Nokia OZO solutions to create and share an immersive experience for educational purposes. We are very proud to work with our esteemed partner HUH to expand our cooperation in the medical field,” says Paul Melin, VP of Digital Media at Nokia Technologies. — Nokia (@nokia) 7. lipnja 2017.